The Toyota GT86 makes a perfect canvas for racing preparation. Toyota&apos;s Motorsports partner Gazoo Racing has prepared a twin-charged GT86 racing model that combines both superior design with impressive power for even better performance on the race track. Officially labeled the Sport FR Concept (as it is also known as the Scion FR-S), the Toyota GT86 seen here comes on the heels of Gazoo&apos;s release earlier this week of their 24 Hours of Nurburgring racecars. 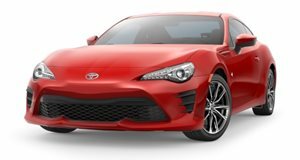 The Toyota GT86 has been twin-charged, meaning it uses both a turbocharger and a supercharger). The GT86 racer features an ECU revamp and a high-flow exhaust system for a total power output of 320hp and 310 lb-ft of torque. Compared to the standard GT86, that&apos;s an extra 120hp and 160 lb-ft of torque. Combine the powerful engine with racing-spec features such as a stripped interior and Gazoo&apos;s own brakes, suspension, dual exhaust, roll cage, lightweight wheels and spoilers, the new concept is certainly a quick ride around the track. No word has come in yet as to whether or not all of these changes will be available as a single package from Toyota, but we are sure some of the pieces will be available for order. Seriously, who wouldn&apos;t want to drop some coin on that huge rear wing? Check out Gazoo Racing&apos;s latest modified Scion FR-S/Toyota 86 in the gallery below.